I thought today would be a great day, the first half gently uphill and the second half down. Well it was .. 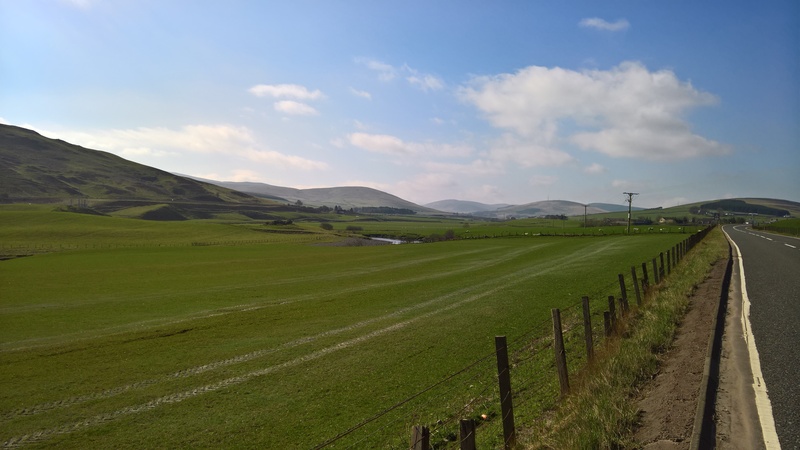 The first third was pretty much how I expected, wide expanses, rolling hills and an undulating run on quiet country lanes, with lush green grass and an endless number of sheep and lambs. On one straigh bit there looked like a large animal sitting on the white line in the middle of the road. I cycled closer very apprehensively, amd it turned out to be a male pheasant picking at a dead male pheasant. Whether he was pulling out plumage, trying to drag him away or just giving him the last rites, I do not know! Then my route joined the N74 south, which sounded good, but it ended up as a lane on a B-road right next to a busy motorway. Although safe, it was very noisy and the road surface was very rough. In England the roads are tarmacked (named after a guy called Macafam) as opposed to our asphalting in Austria. For those of you who don’t know this ptocedure: they pour hot tar on, then small stones or large gravel, which the call chippings (this is probably because if loose, flying ones chip the paint of your car. Then they go over it with a steam roller. At least that’s how they used to do it, i presume its still the same. I think this rougher surface is deliberate for the damp climate here and the tendency to suddenly ice over in winter, to reduce skidding. However it makes slow going on a bike. On one occasion the bike lane was really bad with lots of loose gravel, many broken bits and potholes, so I used the extremely quiet road. A van stopped and the driver said in an angry voice , pointing angrily (finger goingg back and forth) “that’s the cycle lane over there”. I replied “but its in such bad condition”he; “It’s just the dame as the road.” He caused another vehicle to stop behind him before he drove off. As I said, that was a very quiet stretch, but on the latter part a few cars did go speeding past, which made me stick to the bike lane wherever I could. In one part they had even smoothed it, but generally it was slow going and towards the end very boring; just this long straight road with the noise of the motorway and a few trees, no more fields of sheep and lambs. I fear the first part of tomorrow will be much the same, which is a shame as it will be my last day in Scotland and not a good impression to leave this beautiful country with. I have fallen in love with Scotland and am actually sad to be leaving. I had managed to get away before 9 and arrived here before 5 so this is about my average of 10 km. per hour (including stops). Again I was lucky to find a bath and also had the tine to soak my aching muscles before dinner, having drunk my usual cuppa and eaten the biscuits provided to keep me going. 80 km. 486 m. elevation, 7 hours bike time, 8 hours total. Hi Sue. Well done. They haven’t used rollers on the road for many years, probably since the 70s. They just let the traffic flatten it all. It’s all about cost. And yes it does chip the paintwork.